Ice Cream cakes are a birthday favorite at my house. This "cake" takes about 1 hour to complete from start to finish, but it is really only about 20 minutes worth of work) and results in almost zero cleanup (yeah!!). This should be made the day before you need it. 3 pints of your favorite ice cream (I recommend Hagen Daze or another premium ice cream ). (1) Coat a 9-inch round spring form pan with nonstick cooking spray. Line the sides with waxed paper, using spray to help adhere it to the pan. Trim paper to the height of pan. (2) Finely crush 12 Oreos in a food processor. Add measured milk; pulse just until mixture holds together. Set aside. (3) Unwrap 4 ice cream sandwiches. Working QUICKLY, cut each in quarters (cut once horizontally, once vertically). Stack strips of sandwiches on end, packing them snugly together, around wax-paper-lined pan. Repeat with remaining sandwiches to form a stand-up edge. Spoon cookie crumbs into center of pan; press firmly over bottom. Freeze 1 hour. (4) Remove all 3 flavors of ice cream from freezer and let soften for 15 minutes at room temperature (or just defrost it in the microwave for a bit). Spread the flavors on the bottom 1 at a time. You can smooth out the layers by using a spoon dipped in hot water. Top with a thin layer of thawed whipped topping (optional). 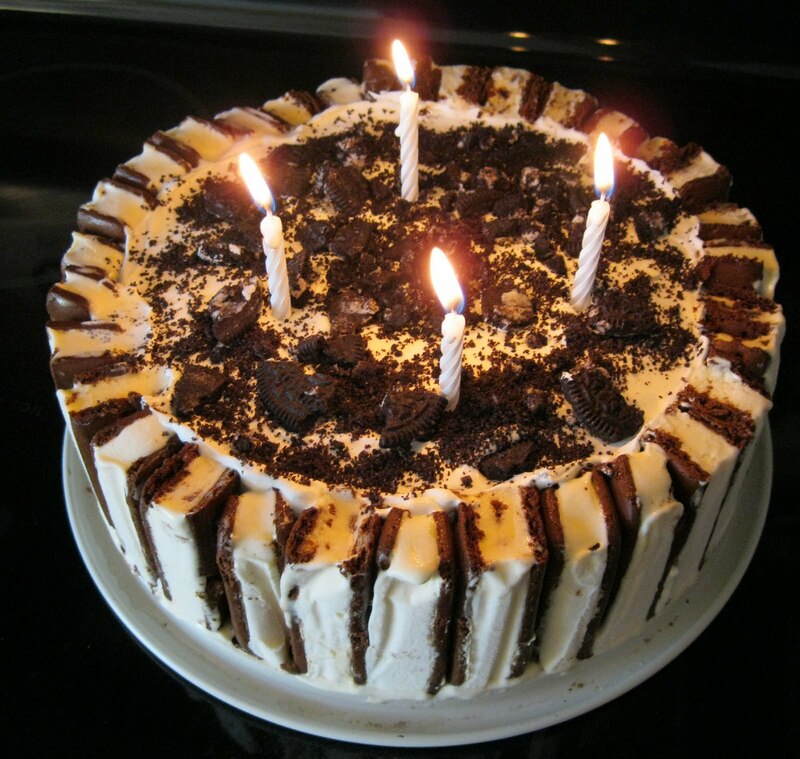 (5) Crush the remaining 3 Oreos and sprinkle over cake. Return to freezer; freeze overnight. (6) To serve, remove side of pan and the waxed paper. Cut into wedges. (1) I do not like very sweet desserts. An less sweet alternative to the Oreo Crust is to use a Graham Cracker / Almond crust: Preheat oven to 350°F. Toast 1/2 cup of whole almonds for 10 - 15 minutes. After they cool, finely grind them in a food processor with 8 whole graham crackers and 1 1/2 tablespoons sugar in a food processor. Add 1/4 cup melted butter; process mixture until moist crumbs form. Press graham cracker mixture onto bottom of springform pan. Bake crust until edges are golden at 350 degrees, about 12 minutes. Cool graham cracker crust completely. 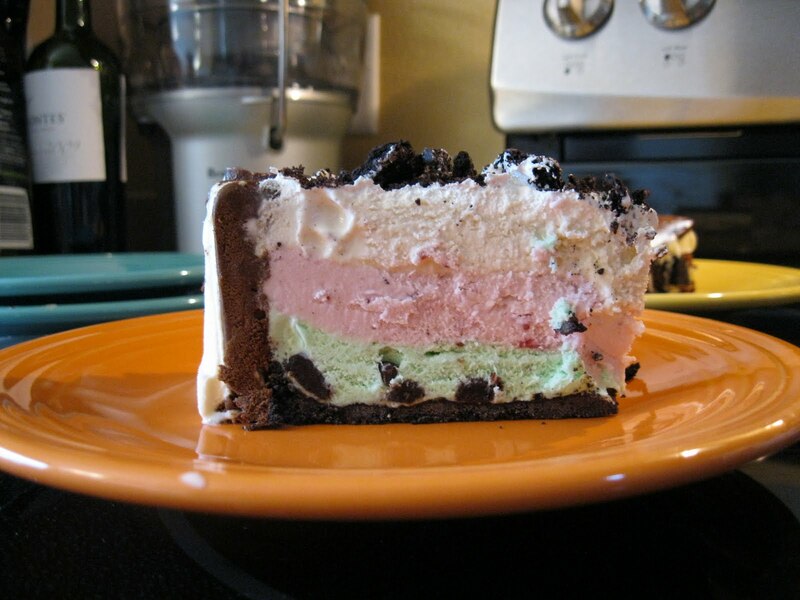 Assembled the ice cream cake on top of the crust. 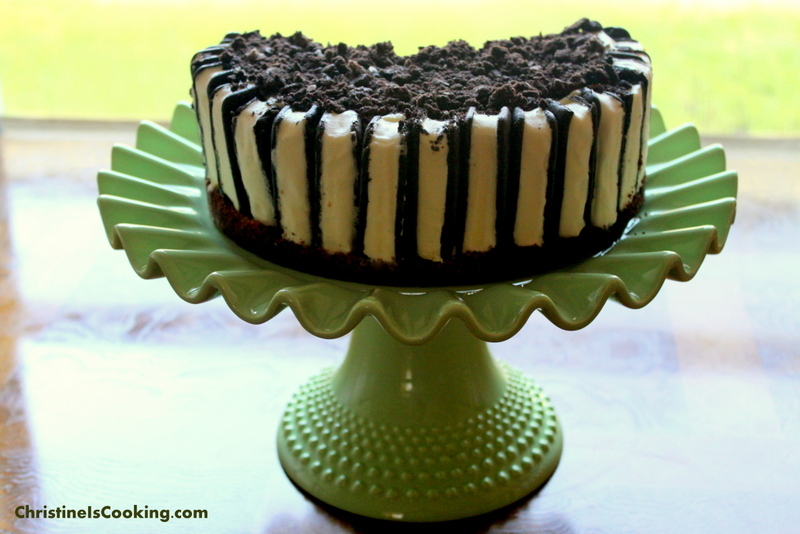 (2) The whipped topping is used on top to make the cake look "frosted." You can forgo the whipped topping if you used Vanilla for the top flavor and still have the same look. However, if you forgo the whipped topping you will need an additional pint of ice cream. (3) Use an ultra premium variety of ice cream like Hagen Daze for this. Because there is no "cake" in this cake except for the ice cream sandwiches, you want the ice cream to be extra flavorful as it is the star in the show here. What can you substitute for the ice cream sandwiches if you have a family member who is severely allergic to chocolate? 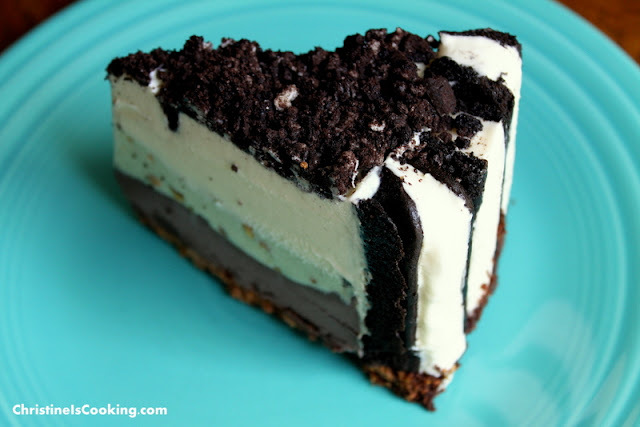 You could omit the ice cream sandwiches and use a graham cracker crust. I made this cake 2 yrs ago and am making it again as it is sooo good!!! Thank you!